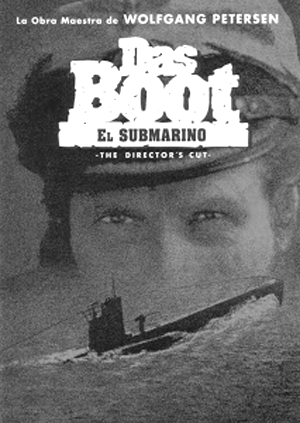 Wolfgang Peterson’s “Das Boot” is a war movie on a German Second World War submarine (U-Boat), the U-96. Though nominated in six categories of Academy Awards of 1982, the theatrical version of “Das Boot” released in 1981 won none. It lost 3 awards to Richard Attenborough’s “Gandhi”, which had bagged 8 awards that year. “Das Boot” which remained the most expensive German movie for a long time, is a gripping depiction of the important battle of Atlantic by a side which lost the War and was responsible for unprecedented atrocities. Nevertheless, for those fighting the battles, it was just another choice-less job for their nation, with a lot of pride at stake. The ways in which the Holocaust and the War are remembered in books, films and monuments across nations has always been a subject of study. This representation of a losing 'wrong' side of one of the most crucial battles of the Second World War helps us understand modern warfare, its complexity and motives. “Das Boot”, meaning “the boat” in German, is based on an autobiographical novel by a German photographer Lothar Guenther Buchheim, a World War II correspondent. It reveals the dark, inhuman side of all wars, the ruthless and indiscriminate disregard for human lives. The film tracks the journey of a very young crew of U-96, which sets out on a patrol mission from La Rochelle, a German Naval base in occupied France in the autumn of 1941. The crew remains at sea for several weeks without any sight or smell of land. The flawless picture and sound quality along with the excellent use of light and cinematography of Jost Vocano and Klaus Doldinger’s soundtrack, beautifully sums up the horror, the thrill, the suspense and the underlying gloom of the Battle of Atlantic amidst the hope and despair of the crew. Increasing presence of destroyer ships, escorting merchant ships sailing from United States to England through the Atlantic was beginning to inflict losses on the sophisticated U-Boats. U-96, like many other German submarines, is assigned the job of sinking vessels of allied forces in the Atlantic. The sight of the submarine surfacing in the dark and the crew anxiously gathering below the deck to breathe fresh air and the alarm and panic created while it suddenly dives on seeing a destroyer ship and then remaining submerged for several hours gives you an inkling of the claustrophobic strain in a submarine. The sound of the propellers of a destroyer ship (right above the submerged U-Boat) getting louder makes you feel that you are right there somewhere near the control room and the torpedo room of the cramped submarine. Every time U-96 is attacked, the crew is conscious that it would only take a moment for the entire crew to get killed with absolutely no chances of escape. One is reminded of the observation of German Grand Admiral Karl Donitz (who was in charge of U-boat operations in WWII) on a submarine crew as “a community bound by fate”. Each member in a way contributed to the U-Boat’s success or failure as well as to the life and death of every crew member. The film captures the constantly changing mood within a submarine as its crew hears depth charges dropped by an invisible enemy or when the captain manages to outsmart the enemy or when the crew hears the explosion on the torpedoes hitting an enemy ship. The eerie ‘ping-ping’, an echo produced when sound signals emitted from the dreaded ASDIC systems (an early form of SONAR) in enemy ships hit the submarine, precedes many of the attacks on U-96. The enemy ship intercepts this echo which gives away the position of the submarine and its distance. The ASDIC system was dangerous enough to make any submariner pray and hope that their Captain does something to mislead their enemy by taking them deeper or out of harm’s range. "The threat the U-Boats posed in the Atlantic was the only thing that really frightened me during the war. On their defeat hung the outcome of World War II." “Outward bound convoy. Five Columns. Very Juicy.”. The excitement is short-lived and as soon as U-96 fires three torpedoes it is forced to dive by the sudden appearance of a destroyer ship. (Very often convoys would adopt a zigzag instead of a straight path which made it difficult for U-Boats to predict the course of the convoy). You cannot help holding your breath when you see the crew run to the front part of the submarine to make U-96 dive fast and escape being attacked. But the ultrasonic ASDIC system eventually helps the enemy detect, attack and cause immense damage to U-96. As the boat is forced to dive beyond its range, several bolts give way to the pressure under the ocean. A fire breaks out and fills the cramped interior with smoke. The Captain’s observation highlights a very horrifying reality in the battle of Atlantic in WWII, the restraint on each side from rescuing even those drowning in the icy waters. Apparently, even allied ships had strict rules not to stop for any reason in the ocean. All that was important at the Atlantic to the allies and to the Germans, was the cargo being shipped to Britain. While the Allies desperately had to ensure that the supplies reached the destination, the Germans had to ensure that England remained beyond reach. It was nobody’s ‘business’ to save lives in the ocean. In what appeared to be the last and biggest hurdle for U-96, it needed to reach La Spezia in Italy through the British controlled Strait of Gibraltar, a narrow strait that separates Europe and Africa. The crew pins all hopes on the Captain’s unimpressive idea of getting very close to the Strait and then diving and letting the surface current pull them through the strait. However, as U-96 moves towards the strait, the enemy sees it and manages to shoot and injure its navigator on the deck. As U-96 dives, it veers out of control and soon touches the bottom of the ocean. Water floods the interiors and bolts burst in the pressure, causing massive damage. The crew fixes the damage and finally after several hours in extremely low oxygen content manages to make it to the surface and start the engines. The Captain decides to take U-96 back to La Rochelle. Despite outsmarting the enemy frequently while at the ocean, the Captain and the crew are caught completely off guard when U-96 is attacked during an air raid as it reaches La Rochelle with a band performing to celebrate their return. Many are injured as they move out of U-96 and run towards the submarine pen. As the raid stops, Lt. Werner comes out of the pen to find that the Captain managed to get out of U-96 but is badly injured. In an unforgettable scene, the Captain is on his knees amongst the dead bodies of Johan, the Second Lieutenant and few others. He breathes heavily and sadly looks at U-96 which suffered damage in the attack and is beginning to sink slowly. The Captain’s rare show of feeling for the U-Boat in a way acknowledges the bond formed between a Captain and his boat. In the last scene, U-96 is seen silently going down the water leaving behind some steady bubbles on the surface. During U-96’s journey, on many occasions the Captain plays the record of the old British World War I song, “It’s a long way to Tiperarry”. Unlike many war songs of the time, it does not encourage soldiers to fight the enemy and seek glory. On the contrary, it reflects the urge to head back home. Through the song, Peterson gives the impression of a clear disenchantment within the crew and particularly with the Captain about the war, a longing to be at home and how the war was gradually lifting the veil that had hung over Nazi beliefs.